Jonathan Aitken was the Director of the Health Design Lab at Emily Carr University of Art + Design from 2012 until July 2016. He applied design thinking and human-centred design research methodologies to complex problems. Aitken’s education in Communication and Industrial Design help him bring an interdisciplinary focus to his research practice, and outcomes include interaction, industrial, and communication design. Aitken is particularly interested in how participatory design methodologies can facilitate design research into large, complex problems. Audrey Grace Bennett is a tenured Associate Professor of Graphics in the Department of Communication and Media at Rensselaer, a past College Art Association Professional Development Fellow, and a Fellow of the Communication Research Institute. Her interests include theory and research on images across media, disciplines, and cultures. Funding for her research is through Rensselaer, the Society for Technical Communication, National Science Foundation, Google and AIGA, the professional association for design. Her monograph, Engendering Interaction with Images, appeared 2012 by Intellect Books (Chicago University Press). The chapter she penned, The Rise of Research in Graphic Design, introduced the collection she edited titled Design Studies: Theory and Research in Graphic Design (Princeton Architectural Press). She is co-editor of the Icograda Design Education Manifesto 2011 and founder of GLIDE, a biennial virtual conference on global interaction in design education. Carlo Branzaglia is involved in strategic design. He teaches at Academy of Fine Arts, Bologna, where he established the Graphic Design and Design Management programs, and the Bologna Design Center. He has delivered public lectures, organized conferences and run workshops in universities in many countries. He is Coordinator of the Master in Graphic Design Management at Ied, Milan. He has published several books (last one: Comunicare con le Immagini, third edition, 2013), and is the editor in chief of the quarterly graphic design magazine Artlab. He is President of Adi Emilia Romagna Delegation; and partner of Dmc Design Management & Consulting. Heather Corcoran is director of the College and Graduate School of Art and the Jane Reuter Hitzeman and Herbert F. Hitzeman, Jr. Professor of Art at Washington University in St. Louis. She is a graphic designer whose work explores relationships of information and expression. She works on questions of informational density, clarity, and audience understanding, also addressing how elements such as image, text, and graphic form create voice, and how data can provoke an emotional response. She was lead writer on "Making cancer surveillance data more accessible for the public through Dataspark," published in the design journal Visible Language in 2013. This article grew out of her role as co-primary investigator on a series of projects to make cancer data more meaningful, funded by the National Cancer Institute 2009–2011. In addition, she was lead designer on the disease risk app "Zuum," a collaborative project with the Medical School, released on Apple iTunes in 2012. Veronika Egger completed a graphics college in Vienna, Austria, is a graduate of Graphic Design at Derby University, UK, and holds an MSc in Design and Management of Inclusive Environments from The University of Reading, UK.She has worked at Philips Design in Vienna, and later founded her own company – is-design GmbH – in 1997 focusing on Information Design. In her practice Veronika combines information design, product design, user interface design and accessibility to a new field of application: Evidence-based user experience design for the built environment. Veronika has been consultant to the Austrian Federal Railways for the inclusive design of the new Vienna Central Station, several large architectural projects in Austria, Vienna Public Transport, the Austrian Police Service/Ministry of the Interior, pharmaceutical companies such as Merck, Bayer, Sandoz, and many more. Veronika is a board member and deputy director of the International Institute for Information Design (IIID) and Life Fellow of the Communication Research Institute (CRI). She co-founded design for all, an organisation promoting inclusive design in Austria and leads the Experts Cluster Inclusive Design of Design Austria. Kim Erwin is Associate Director of Population Health Sciences at the University of Illinois at Chicago, and a Research Professor at the UIC School of Design. Kim is trained in user-centered design methods, which put people at the center of any problem space so as to develop solutions that better fit the lives, activities and context of everyone involved in healthcare delivery. Her federally-funded work promotes the merger of Design and Healthcare sciences, where critical medical interventions must be aligned with human behavior in order to be adopted. Her research targets communication-intensive touchpoints, such as care transitions from ERs and hospitals. She works with medical researchers to apply design’s strength in systems thinking, people-centered methods and collaborative work processes to help medicine better fit people at all levels of the care delivery system. Wes Ervin was drawn into the field of information design in the 1980s while working for Wall Street financial firms. He pioneered new methods of visualizing financial information using what was then the most advanced graphics technology. He subsequently formed and ran his own firm, Information Design Associates (IDeA), for ten years in New York City. In 1995 he founded the first not-for-profit information design organization in the US and organized several conferences on information design at Harvard University. He currently works for a public-sector health care system in South Florida. Wes was Vice President of the International Institute of Information Design (IIID) from 2006 to 2014. He also is on the Editorial Board of the Information Design Journal. Wes earned his undergraduate and graduate degrees from the University of Chicago and held an academic position in the Stern School of Business at New York University for five years. Regina Hanke co-founder of Lindgruen, started her career in London as graphic designer. After years with “The Partners” in London, where she learned that good ideas can create a market pull, she worked for “MetaDesign” where she acquired profound knowledge of branding and corporate design processes working for international corporations. Her last engagement as an employee at “Frog Design” introduced her to research as an integral part of every product development process. Equipped with extensive experience, an additional degree in marketing and the passion for brands and design, she founded the Lindgruen GmbH in 2006. Since 2007 Lindgrün GmbH started to work with international corporations like Volkswagen AG, hospitality services, like residences for elderly or handicapped people. Since 2010 Lindgrün GmbH focusses on Scientific Health Care Communication – working closely with world-leading medical scientists to communicate health care issues, like Antibiotic Resistance, Sepsis and Infectious diseases. As Co-Founder and Design Director she develops beyond the surface campaigns – combining profound Branding Know-How, Marketing and Service Design peppered with understanding of Cultural DNA and medical insights. Richard Hunt has practiced typography for over 20 years and acted as a consultant to many notable designers, architects and other institutions across North America and elsewhere, including Bruce Mau Design, Zone Books, Rizzoli, KPMB Architects, Rhode Island School of Design and the Getty Institute. He is Assistant Professor at OCAD University, where he teaches typography and typeface design in the studio and the history of typography in a lecture and online format. He has taught at Sheridan College, York University. He has recently presented for the Registered Graphic Designers of Ontario, Typecon 2014 and Design Thinkers 2014. His research interests include information design and typeface design for print and screen, contexts of legibility and readability, and the history, state, and future of communication technologies. Claudine Jaenichen is an information designer specializing in the relationship between design and cognition. Her recent work in applied design research serves a precise communicative role for, or in, cognitive demanding events. Advocating inclusivity through design is central in pursuing design research for evacuation information and projects that address public information. She prioritizes participatory design methods and the importance of benchmarking as methods to measure the success of a project and how it communicates to its intended audience. She is an Associate Professor at Chapman University, a Life Research Fellow for the Communication Research Institute and the International Institute of Information Design (IIID) Executive Board member. Both her practical design work, as well as her research work, has been included in information design, social sciences, graphic design and psychology national and international publications. Peter Jones has led the design and user research of interactive resources for clinical, educational and scientific practice throughout the Internet era. He teaches and advises in human-centred service design for clinical work, health IT and workflow, with an interest in transforming health practice from a whole person care perspective. Peter has over 10 years’ experience with major providers in ethnographic research and full-lifecycle design of point of care informatics and learning resources for physicians, nurses and specialists. Peter’s research interests include: Scientific and clinical knowledge media design for informing practice, patients, and complex care problems; Soft services design, a systemic approach to designing for community and social health contexts; Clinical education innovation and multi-perspective health pedagogies; Point of care and diagnostic communications and decision making; Organizational and institutional change with systemic design and dialogic methodologies. Dr. Jones’ book Design for Care (Rosenfeld, 2013) develops many of these methods and cases related to the spectrum of healthcare services (www.designforcare.com). Joyce Lee, MD, MPH is a Physician, Designer, and Researcher, and the Robert P. Kelch, MD, Research Professor of Pediatrics at the University of Michigan. Dr. Lee's work focuses on the development of learning health systems using the methods of clinical informatics, quality improvement, and patient-centered participatory design; studies of collaborative innovation networks and patient-centered innovation; and integration of the maker movement into healthcare. She has over 90 peer-reviewed publications, is Principal Investigator for a number of federally funded grants, and was a visiting scholar at Google Life Sciences. She also leads an interdisciplinary collaborative called HealthDesignBy.Us, which supports patients as experts and "makers" in the creation of tools, technologies, and systems for their own health. You can find her on Twitter https://twitter.com/joyclee, Mediumhttps://medium.com/@joyclee, and at http://www.doctorasdesigner.com/. Robert Lederer has practiced as an Industrial Designer both as a staff designer and a freelance consultant in Australia and in Canada, and has specialized in medical design. He joined the University of Alberta as a sessional instructor in 1986 and as Assistant Professor and Program Coordinator in 1999. He is currently Associate Professor of Industrial Design. A long-term collaboration project with the Faculty of Rehabilitation Medicine in the development of student projects using Universal Design methodology and the design of products for an aging population received a commendation by the American Society on Aging for Exemplary Program in Industrial Design (2002). In the last four years this collaboration has expanded into the inclusion of Computing Sciences and Pharmacy with the establishment of the SMART CONDO a research facility in ECHA that is examining issues of an aging population and independence. The group received the UofA Provost Unit Teaching Award for 2011. At present he is working with issues to do with bariatric care. Robert teaches classes in design principles, human factors, and advanced industrial design practice. At his time at the university he has collaborated with industry partners to design, develop and produce working prototypes of various medical devices. Robert Linsky Information Design Doc, is the Director of Information Design at NEPS, LLC a leading CCM firm. Robert created Locate/UNderstand/Act (LUNA) ™, the design of information for clear communications. His expertise is in variable data, transaction-based documents specifically in the healthcare, financial services and insurance industries. He is committed to creating clear communications utilizing the principles of good information design including plain language, typography, graphic design, analysis, psychology, stakeholder management and usability testing. Robert is a Life Fellow of the Communications Research Institute (CRI), a member of the International Institute for Information Design (IIID), on the board of both PLAIN and the Information Design Association (IDA). He is also on the editorial board of IDJ, the Information Design Journal and for three years served as Director of Judging for the Center for Plain Language’s ClearMark Awards. He has been a speaker at numerous conferences and seminars. Nicolò Luppino, PhD main interest is to apply design to bring innovative solutions to improve healthcare quality and safety. During his PhD at the University IUAV of Venice, he investigated the design issues concerning the increasing use of automation in healthcare and how this affects patient’s safety and experience. He has worked as visual designer and researcher in the development of a web-based system for the collection of personal health records, and in the design of orientation-systems for hospitals to make them more effective. He has a great experience in the planning and design of complex healthcare environments, dealing with the patient’s experience, healthcare protocols and the logistic process. Within this topic he developed effective tools to improve decision making processes within the planning and design phases concerning complex healthcare environments and related services. Currently he works for a consulting office in Switzerland planning and designing hospitals and pharmaceutical laboratories. BSc Industrial Design, MSc Product and Medical Design, PhD in Design Sciences. Stephen Martin is an Associate Professor of Family Medicine and Community Health at the University of Massachusetts Medical School. He also serves as residency faculty at Boston University School of Medicine and is a member of the faculty at Harvard Medical School’s Center for Primary Care. After four years with the National Health Service Corps in a community health center and federal prison medical center, he cares for patients and teaches advanced practice clinicians, residents, and medical students in rural Central Massachusetts. Steve is founding project director of TandemHealth, a partnership between Consumer Reports and the National Physician Alliance to develop evidence-based electronic resources for clinicians and patients. Steve is the lead author of publications in the BMJ, JAMA, and Lancet. In 2013, he was named Preceptor of the Year by the Massachusetts Academy of Family Physicians. Judith A. Moldenhauer is Professor for Graphic Design in the Department of Art and Art History and Interim Associate Dean for Student Affairs and Research in the College of Fine, Performing and Communication Arts at WSU. Her research and work focus on information design, especially for healthcare, and she has authored papers and journal articles on information design. Her professional work has included designs for several exhibitions at the Detroit Institute of Arts and educational materials for Healthy Start, a U.S. government program to reduce high infant mortality. She has collaborated with nursing colleagues to develop materials, including a smartphone app, that can help women recognize and seek help for postpartum depression. She has presented numerous papers for national and international conferences and authored journal articles on information design and design education. She was the WSU PI for the US FIPSE grant, “Seeing the Body Elsewise: Connecting the Life Sciences and the Humanities,” and the US/EC FIPSE grant, “Development of Core Competencies and Student and Faculty Exchange in Information Design.” Honors include several design awards, a Fulbright Fellowship to Sweden and selection as a Life Fellow in the Communication Research Institute, Australia. She serves as Education co-chair for the International Institute for Information Design and is a member of several other professional organizations such as the Design Research Society, AIGA, and the College Art Association. Pamela Napier is Co-founding Partner of Collabo Creative LLC, a human-centered service design firm based in Indianapolis, Indiana. She has a BFA in Visual Communication Design, and an MFA focusing on Design Thinking and Design Leadership, and is also currently an Assistant Professor of Visual Communication Design at Herron School of Art and Design, where she teaches across both the graduate and undergraduate curricula. Her research interests include the integration of values into the design process, design facilitation, and tools and methods for collaborative, human-centered design research. She has presented and deployed her research nationally and internationally, and has given presentations and facilitated workshops at design education conferences, events and universities. Guillermina Noël holds a PhD in Design Sciences from the University IUAV of Venice, Italy, and a Master of Design from the University of Alberta, Canada. She has worked on the design of materials for people with severe speech and reading impairments, interacting with neurologists, educational psychologists, and speech therapists, emphasizing the importance of user-centered design and design for users with special needs.She has participated in conferences and delivered lectures and workshops in Argentina, Italy, Switzerland, Brazil, Canada, USA, Paraguay, Sweden, Spain, Cuba and Mexico. She has taught design at the University of La Plata, at the University of Alberta, at the University of La Matanza, and at the Universidad de las Americas Puebla, and works professionally in visual communication design since 1997. Since 2003 her practice focuses on health related design issues. She is a human-centred knowledge designer and the lead of the Health Innovation Studio at the Faculty of Medicine & Dentistry at the University of Alberta. Belinda Paulovich is a Lecturer in Graphic Design at Charles Sturt University, New South Wales, Australia. She holds a PhD in Visual Communication and a Master of Visual Art and Design from the University of South Australia. Her research has explored ways in which designers can collaborate with professionals in health, medical and scientific domains to produce communication solutions that are visually appealing, functional, accurate and user-centred. She has presented her findings on design and health collaboration at local and international conferences and seminars. Belinda is interested in collaborative practice, self-reflective practice, power dichotomies in the health field and the challenges associated with conducting qualitative design research in medical environments. Professor Martin Pitt has an early academic background in cognitive science and human-computer interaction. His early research work involved the development of interactive multimedia systems and discrete event simulation for use by healthcare professionals. In 2003 he joined Exeter University UK where he helped establish and now co-ordinates MASHnet - The UK Network for Modelling and Simulation in Healthcare. Martin is currently Associate Professor of Healthcare Modelling and Simulation at Exeter University Medical School and Director of PenCHORD - The Peninsula Collaboration for Health Operational Research and Development. He has a long-standing and wide-ranging experience in healthcare modelling ranging from economic modelling in Health Technology Assessment to operational models and simulation for service re-design. His research interests are broadly the application of modelling and simulation techniques in health. He has a specific interest in promoting the effective implementation and evaluation of models in healthcare and the use of visualisation techniques to improve the accessibility and application of modelling techniques in the policy and decision making process. Natacha Poggio Natacha Poggio is a social impact design strategist, educator and advocate of design for social change. She is Assistant Professor of Graphic Design at the University of Houston Downtown. She taught at Lamar University and the University of Hartford, United States. In her teaching and research, Natacha explores how design can contribute to humanitarian issues. Natacha brings a human-centered approach to address problems in health, sanitation, sustainability, and social justice within local and international communities. In 2008, Natacha founded Design Global Change [DGC], a creative collaborative that contribute innovative solutions to social issues. Through this work, she collaborates with healthcare organizations such as Unite for Sight and LIMBS International. She is interested in technology to expand access to wellness. She received the Sappi Ideas that Matter award, to implement “Bringing Girls into Focus” and the “Prosthetics Training Across Borders.” Natacha has a B.F.A. in Graphic Design from the University of Buenos Aires, Argentina and a M.F.A. in Experience Design from The University of Texas at Austin. Since 2011, Natacha is part of the Founders’ Circle of the Winterhouse Symposium on Design Education and Social Change. Helen Sanematsu is an Assistant Professor of Visual Communication Design at the Herron School of Art and Design, Indiana University. She brings people-centered design approaches to patient and community engaged health research, with an emphasis on children’s health services and community medicine in urban and rural settings. She is the founding design researcher for the Patient Engagement Core, a part of the Indiana Clinical and Translational Sciences Institute (Indiana CTSI). The Patient Engagement Core supports health studies at Indiana University, Purdue University, and the University of Notre Dame with people-centered approaches that integrate patient perspectives into research. She has been a co-investigator or project partner on a number of interdisciplinary studies with the IU Schools of Medicine and Public Health; the Community Health Engagement Program, Indiana CTSI; and the Indiana State Department of Health. Sanematsu received her A.B. from Occidental College and her MFA from the Yale School of Art. Debra Satterfield Associate Professor of Design, California State University Long Beach, has extensive research and publication in design for social inclusion, design for behavioral change and the design of educational learning experiences for children with cognitive and physical disabilities. She has published this work through the International Society for Autism Research (INSAR), the Design Research Society (DRS), the International Association of Societies of Design Research (IASDR), and Interaction Design and Children (IDC). She collaboratively teaches courses on smart home technologies and is conducting research on communication for children with autism spectrum disorders and its implication for design. Her ongoing studies also include research on the design of medical decision aids for college women with regard to reproductive healthcare. She is an active researcher in Human Computer Interaction (HCI) through the ACM’s Special interest group on Computer Human Interaction (SIGCHI). Karen Schriver is a researcher and consultant in information design and clear communication. As Principal of KSA Communication Design & Research, she advocates for evidence-based decision-making—challenging organizations to re-imagine their communication design strategies on the basis of research. Winner of 11 awards for her research, Karen brings expertise in designing clear, usable, and memorable content for expert or lay audiences. She is interested in how people contend with information about health on the Web and with how writing and design influence people’s cognitive and emotional engagements with health-related content. She was a consultant to the Centers for Disease Control and Prevention for its Health Literacy Index. Her book Dynamics in Document Design is used in corporate and academic environments around the world. She is currently working on a book about evidence-based information design and plain language. She holds a Ph.D. in rhetoric and communication design from Carnegie Mellon University. Peter Simlinger graduated in architecture from the University of Technology Vienna. After postgraduate studies at the Bartlett School of Architecture, University College, London, he founded his business Simlinger Informations-Design GmbH (SID) in Vienna, Austria. SID's focus is on orientation systems for traffic & transport, hospitals, office/science parks and recreation grounds. He holds the "Brunel Award for Outstanding Visual Design in Public Railway Transportation.” The signage system he devised for Vienna airport allowed for implementation of public information symbols developed under Peter Simlinger's chairmanship of relevant ISO and National Standards working groups. Peter Simlinger is founder of the International Institute for Information Design (IIID), Past-President of Graphik-Design Austria (GDA) and originator of its successor Design Austria (DA). Having decided to step down from his function as IIID Director he founded IIID's daughter IIIDre (International Institute for Information Design Research & Education) in 2013. Peter Simlinger is one of the four editors of Information Design Journal (IDJ), after having handed over his obligations as General Editor with the completion of volume 20. Dr Carla G. Spinillo holds a PhD from the University of Reading, UK (2000) and post-doctoral studies at Avans University, Holland (2010). She is a lecturer and researcher at the Federal University of Paraná/Postgraduate Programme in Design, Brazil. Carla has a grant from the Brazilian Ministry of Science and Technology to research on information design applied to the health field. She is the general editor of the Information Design Journal (John Benjamins Publishing, Holland), and former co-editor of the Brazilian Journal of Information Design (2003-2013). Carla is also member of the editorial policy board of the Journal of Visual Literacy and Associate Editor of the Books of Selected Readings, International Visual Literacy Association conferences (USA). In addition to her academic work, Carla is affiliated to the IVLA (board of directors 2008-2010) and to the SBDI -Brazilian Society of Information Design, organization she co-founded in 2002 and in which was twice its president (2003-2005, 2005-2007). Will Stahl-Timmins. I believe that infographics and data visualisation can transform data into something much more useful: Knowledge. I have a strong interest in visual communication of health research. I'm a designer first, with a secondary interest in research and a PhD on the use of information graphics in health technology assessment from the University of Exeter Medical School. I currently work for The BMJ, one of the world's leading general medical journals. I design interactive information graphics which present research, educational materials and guidelines, as well as news and comment. My research focusses on comparative evaluation of different information presentation formats, and their impact on understanding and memory. Andrea Taylor is a Research Fellow within the School of Design at the Glasgow School of Art, Scotland. Andrea studied Interaction Design at the Royal College of Art in London and holds a 1st Class Honours Degree in Visual Communication Design. She has a special research interest in the design of products, services and systems that use technology to support the health and care of remote and rural populations. In collaboration with academic and industry partners, key recent work includes: a pilot study that demonstrated the feasibility and acceptability of delivering a rehabilitation programme to a group of people with lung disease in their own homes using a novel video conferencing system; and innovation of the community alarm, a mainstream but underused telecare product, involving a ‘live’ student project and participatory design activities with users. Other professional experience includes working as a Research Assistant at MIT Media Lab Europe. Dr. Emmanuel Tsekleves leads research at the intersection of design, health, wellbeing and technology at the Imagination@Lancaster research lab. He conducts research in the design of technology-inspired health interventions and services, which are created by end-users and are aimed at improving the quality of life and wellbeing of people into old age, including people with chronic health problems (i.e. Dementia, Parkinson’s, Stroke). Emmanuel also researches preventative tools that encourage healthier behaviours through the use of playfulness and interactive playful objects. Emmanuel’s research work has been published in over 60 international research articles and received public attention, having been featured by the Daily Mail, Daily Mirror, The Times, Discovery News Online and several other online outlets. He is the co-editor of the Taylor Francis Design for Healthcare book to be published in 2017 and blogs regularly for The Guardian and The Conversation on the design and use of technology in Health. 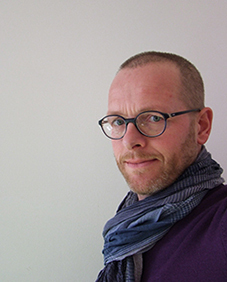 Remko van der Lugt is Professor of Co-Design at Utrecht University of Applied Sciences. His research focuses on involving users in collaborative creative design activities, enabling them as experts of their experiences. He has a particular interest in systemic design, the ways in which designers can facilitate change. He has been involved in planning and facilitating a variety of health-related co-design projects, both in the care institutions (such as healing environments, child oncology, emergency care) and outside (such as designing for healthcare professionals, mobility after stroke regression after chronic pain treatment). Remko received his Ph.D. degree in Industrial Design Engineering (on sketching in design idea generation meetings) from from Delft University of Technology and his Master’s degree in Naval Architecture from the same university. He also received a Master’s Certificate in Creative Studies from the Center for Studies in Creativity at Buffalo State College, State University of New York. Remko has broad experience in facilitating creative processes in a variety of organizations, in business, non-profit and government. Karel van der Waarde studied graphic design in the Netherlands (The Design Academy, Eindhoven) and in the UK (De Montfort University, Leicester and the University of Reading). In 1995, he started a design - research consultancy in Belgium specializing in the testing of information design. His company develops patient information leaflets, instructions, forms, protocols, and the information architecture for websites. Most of the projects are related to information about medicines for patients, doctors and pharmacists. Avans University of Applied Sciences (Breda, The Netherlands) appointed him as scholar in Visual Rhetoric between 2006 and 2014. From September 2014, he’ll be teaching (part time) at the Basel School of Design. Van der Waarde is a life-Fellow of the Communications Research Institute (Melbourne, Australia), a board member of International Institute for Information Design (IIID, Vienna, Austria) and editorial board member of Information Design Journal, Journal of Visual Communication, the Poster and Visible Language. Patricia Wright is a behavioural scientist whose research explores the cognitive processes underpinning adults’ use of printed and digital information to accomplish goals such as taking decisions (e.g. when reading healthcare leaflets, on-line shopping, using interactive decision aids), or performing actions (e.g. procedural instructions; way-finding information), or consulting for reference (including tables and graphs). Her research has shown that appropriate design helps people achieve their reading goals. After a BSc and PhD in psychology from University College London, she joined the MRC Applied Psychology Unit (APU) in Cambridge, UK. She has been elected a Fellow of the British Psychological Society, Fellow of the Institute of Scientific and Technical Communicators, Honorary Fellow of the Society of Technical Communicators, and a teaching Fellow of Churchill College, Cambridge University. When APU closed she moved to Cardiff University in Wales, UK. Her current research interests include the problems posed to older adults by the interfaces of digital tablets. Mike Zender is Professor of Design at the University of Cincinnati. Professor Zender received his MFA in 1977 from Yale University where he was the Carl Purrington Rollins Fellow. In 2004 he was a Medical Informatics Course Fellow at the Marine Biology Laboratory, Woods Hole, MA. A third generation typesetter and designer, Mike founded and operated the design practice Zender + Associates, Inc. for thirty years. Professor Zender’s work and that of his associates was published regularly and exhibited broadly. Professor Zender is a past president of Cincinnati AIGA (American Institute of Graphic Arts) and in 2009 was named a National Fellow of the AIGA for his contributions to design and design education. Professor Zender has written two books on design, more than 25 journal articles, and in 2013 became editor of the 48 year-old communication design research journal Visible Language. Professor Zender’s research on communication through simple symbols such as icons and pictograms, specifically in the medical domain, and the application and testing of these in global cross-cultural communication, is uncovering principles for communication design and design research.